part of other Fenno-Scandinavian VHF experiments. as a pathfinder for technologies to be used in the proposed EISCAT_3D system. It is also LOFAR station FI609... the northernmost LOFAR station, providing long-baselines and a vital ionospheric calibration point to the wider LOFAR radio telescope network. KAIRA will be built over 2011 and 2012. Because it is located in the Arctic (latitude +69), the build season (when there is little or no snow or ice) is very short. This year we will build the High-Band Array (HBA), and the Low-Band Array (LBA) will be built next year. The HBA build is starting now, as the last of the snow has almost vanished. 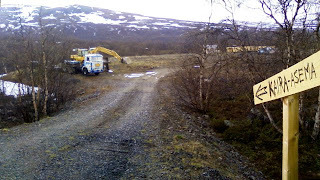 Here is the view of the site entrance ('KAIRA-asema' is Finnish for 'KAIRA-site'). The first of the ground works equipment has been moved in, ready to start later in the day. Additionally, the frames can be seen in the background behind the trees (more on this later). There is still a couple of patches of snow about, but the bulk of it is now gone and we are ready to start a couple of very intensive months of construction. We also intend to keep this web log updated very regularly. You can expect at least two reports per day, as there will be a lot of activity covering all sorts of varied topics. So, if you want to see an 'Extreme-LOFAR-build' in action, are interested in the new test plans or EISCAT_3D, or you simply have an interest is how remote science projects are deployed in rugged locations, make a point of bookmarking http://kaira.sgo.fi/ and check in regularly. There will be a lot to see! What is a mosaic image?